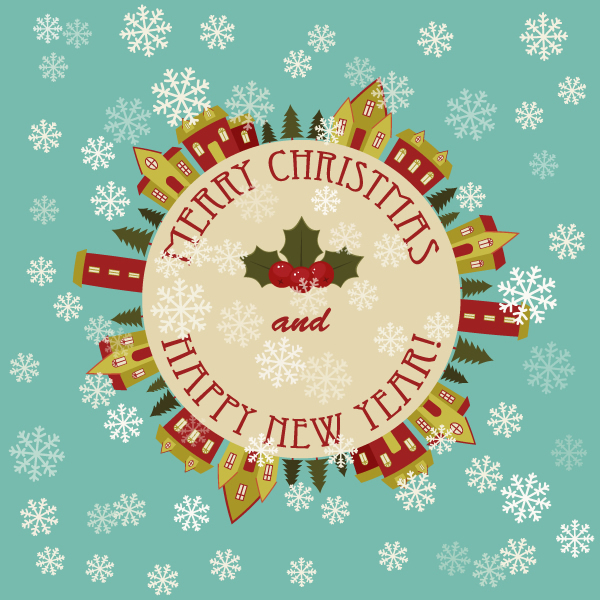 In this tutorial, you’ll learn how to create a beautiful, snowy greeting card in Adobe Illustrator. 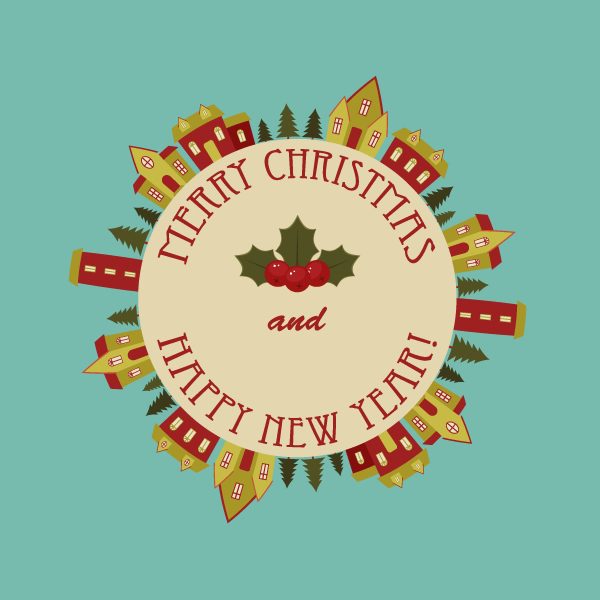 This includes creating a Pattern Brush of tiny houses, to text warps, drawing simple-shaped holly berries and making two fills; as well as learning how to use the Symbol Sprayer Tool. Now, let’s begin! Use the Rectangle Tool (M) to draw a square with a fill color of R=119 G=186 B=174 and a width and height of 600 px. Use the Ellipse Tool (L) to draw an even circle and set its color at R=227 G=214 B=174. 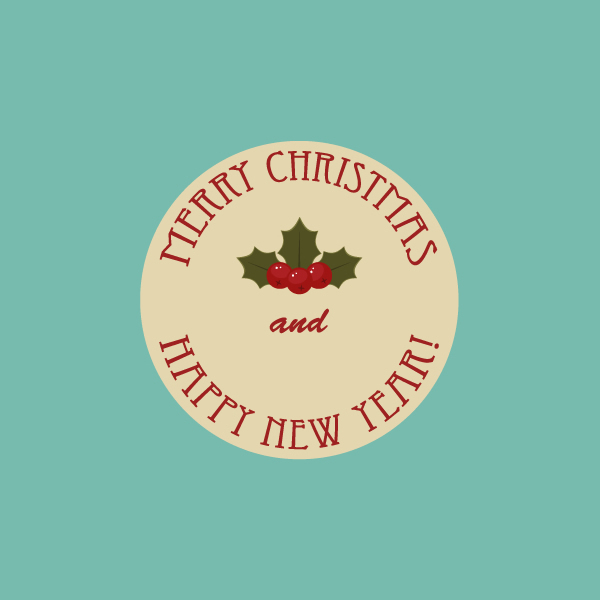 Choose your favorite font and type your greeting text. 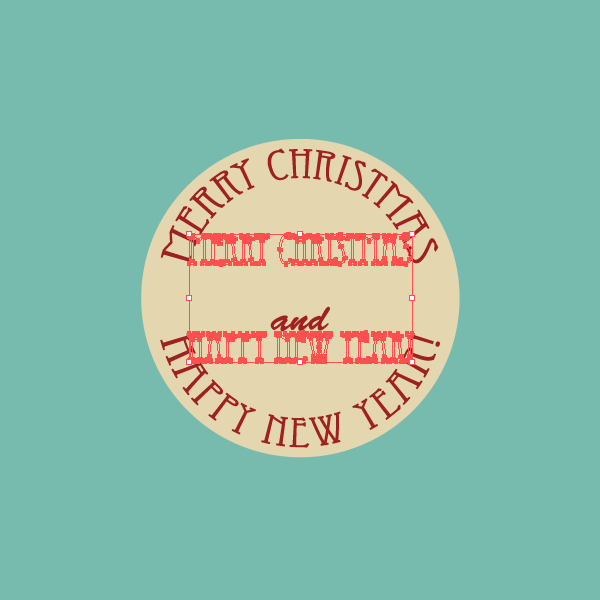 If you’re using similar text greeting, select “Merry Christmas” and go to Effect > Warp > Arc. In the new window, adjust the options: Style Arc Horizontal, Bend 83%, Distortion Horizontal 0% and Vertical 0% and click Okay. Select the text “Happy New Year“, go to Effect > Warp > Arc. Adjust the following options: Style Arc Horizontal, Bend -83%, Distortion Horizontal 0% and Vertical 0%. Image 1. To create a berry, we’ll start from the sepal. Set Fill color: R=104 G=18 B=17 and draw a tiny narrow ellipse. Use the Convert Anchor Point Tool (Shift+C) to make the top and bottom anchor points sharp. Select the ellipse with sharp corners and click on the Rotate Tool (R) located on the Tools panel. A pop-up window will appear. Type 90 degrees and press Copy. 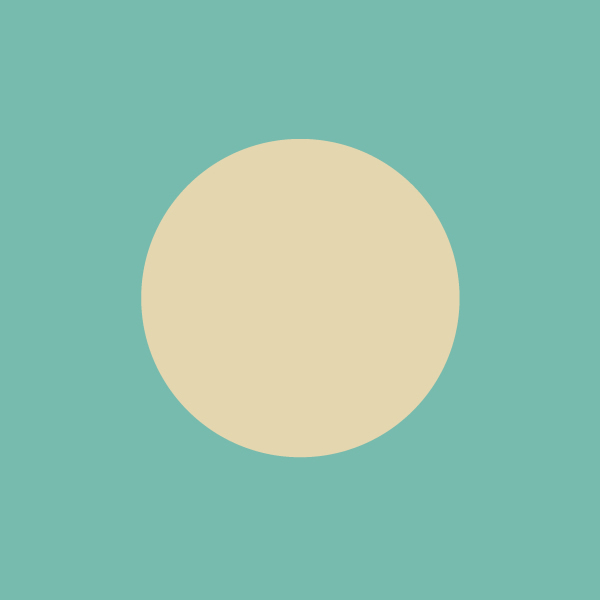 Draw a circle (Fill color: R=158 G=25 B=19). 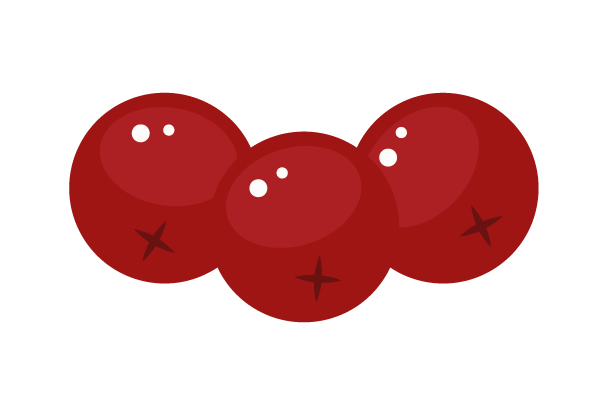 That’ll be the base of the berry. Put the sepal on the berry. Add a lighter ellipse (R=172 G=32 B=36) to show the volume of the berry and two white circles. Image 1. Drawing the leaf. Draw a circle and set its color as R=80 G=80 B=34. With the circle selected, go to Object > Path > Add Anchor Points. We need to distort this ellipse. Go to Effect > Distort and Transform > Pucker and Bloat. In a new dialogue window, move the slider to -20%. Add the warping effect: Effect > Warp > Arc. Select Style Arc Horizontal, Bend 0%, Distortion Horizontal 0% and Vertical -24%. 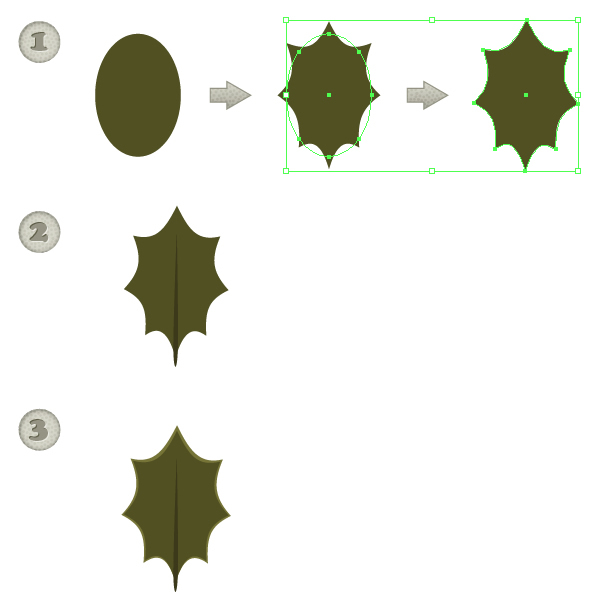 Make a copy of the sepal on the berry (one sharp ellipse), and place it on the leaf. It’ll be the stalk of the leaf. Change Fill color to R=59 G=57 B=25. Image 3. Just as the volume added to the berry, we have to do the same for the leaf. Select the base of the leaf, make one copy on the back (Control-C, Control-B), and change the fill color to R=119 G=116 B=55. Use the Selection Tool (V) to make the lighter back copy of the leaf a little longer on top. Your leaf is ready. Set Fill color: R=157 G=33 B=33, take the Rectangle Tool (M) and draw a rectangle. Hit the Direct Selection Tool (A) and move two upper anchor points closer to each other. It’ll be a wall of the 1st house. Let’s create a roof. Simply copy the wall, change Fill color to R=166 G=150 B=51, and make it smaller. Put it on top of the wall. Draw a rectangle to create the window (R=234 G=224 B=19). To create a frame, go to Object > Path > Offset Path, and type 10px, Joins Miter, Miter limit 4. You can adjust the thickness of the window frame by increasing or decreasing Offset Path. 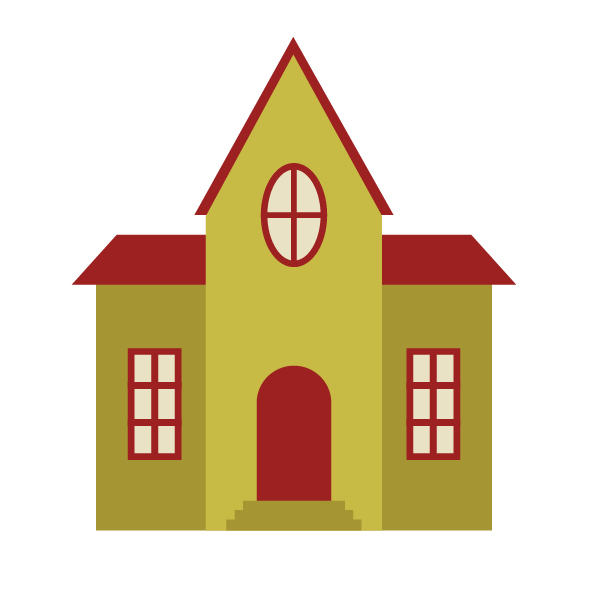 With the frame selected, take the Eyedropper Tool (I) and the Fill color of the roof. Draw a narrow rectangle with the same color – your window is now done! 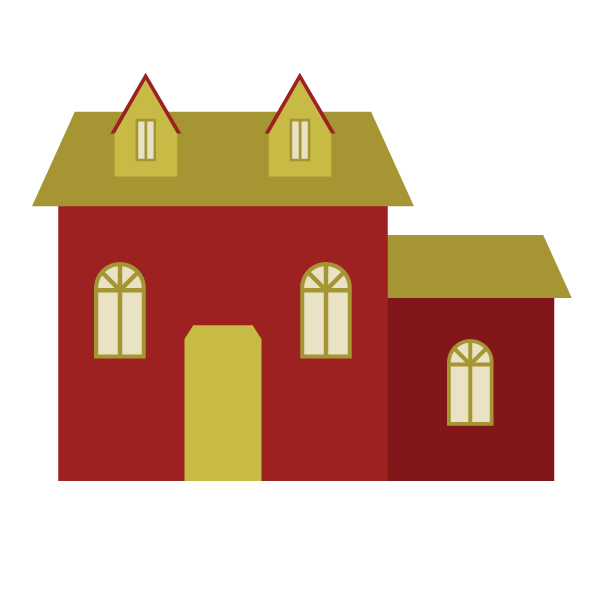 Put three windows on the house. Image 1. Lets create a Christmas tree. Take the Polygon Tool and click on your artboard. In the new dialogue window, type 3 Sides with any Radius. Then click OK.
Set Fill color: R=81 G=81 B=34. Keep it selected and go to Effect > Warp > Bulge. In the new window, Warp Options will pop up. Set the Style to Bulge Vertical, Bend -15%, Distortion Horizontal 0%, Vertical 25%. Make a few copies of this triangle, with the previous ones smaller than the next one. Add a stem (R=157 G=33 B=33). Create one more smaller and darker Christmas tree (R=59 G=57 B=27). Use the Rectangle Tool (M) to create a rectangle (R=166 G=150 B=51) and the same roof as you created for the 1st house in the step 3.1. Change the color of the new roof to R=157 G=33 B=33. Draw a rectangle (R=200 G=186 B=68) and using the Add Anchor Point Tool (+), put an anchor point on the top side of this rectangle. Take the Direct Selection Tool (A) and move just this new anchor point up. 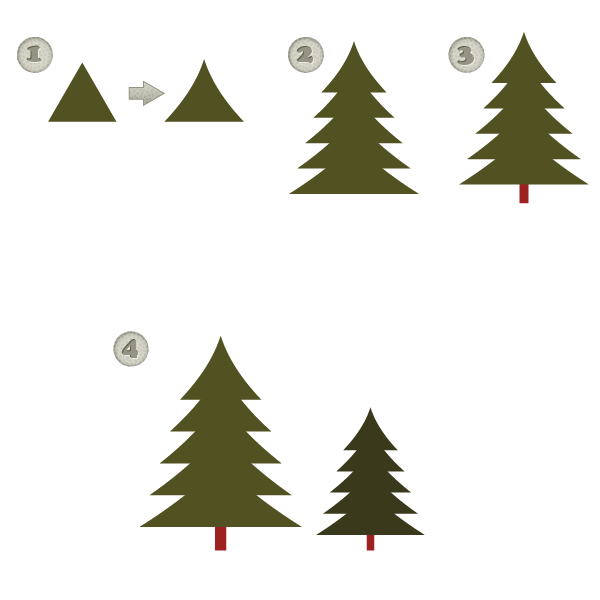 Draw a triangle using the Polygon Tool as you did for the Christmas tree in step 4.1. Set Fill color: R=157 G=33 B=33 and put it on the back (Control-X, Control-B). Place the shapes of Image 1 under the shapes you created in Image 2. Create the window using rectangles. For the window frame, use color R=157 G=33 B=33, and for the glass R=234 G=224 B=195. Make two windows and place them as shown. Use the same Fill color for frames in this oval window as you used for the previous rectangular windows. And the same color for window glass. Put the oval window on the house. Draw a rectangle (R=157 G=33 B=33) and go to Effect > Warp > Arc Upper. Enter this in a new window Style Arc Upper, Horizontal, Bend 100%, Distortion Horizontal 0%, Vertical 0%. 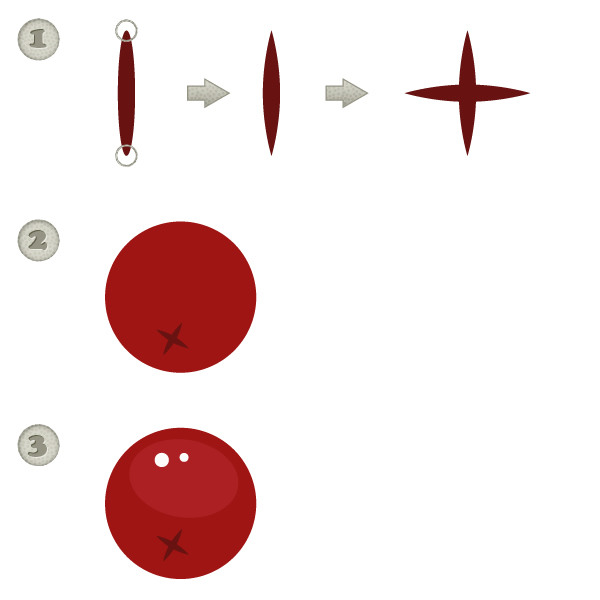 Expand the newly created shape (Object > Expand Appearance). Add three steps (Fill color R=166 G=150 B=51). 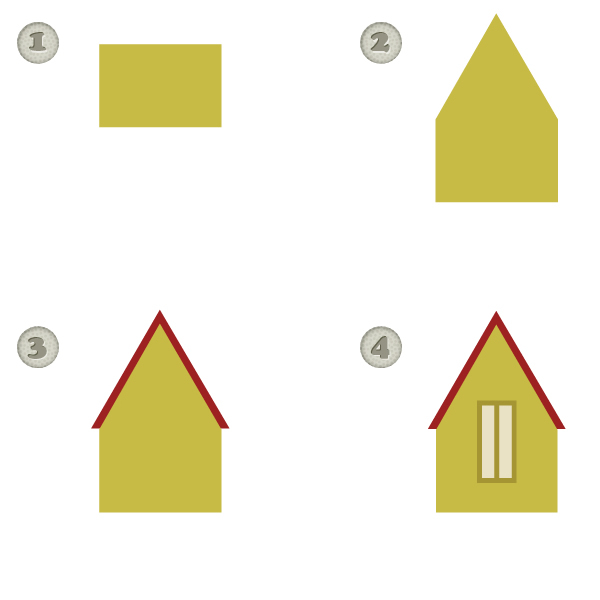 Draw the 2nd house like how you drew the 3rd house in step 3.1. Create the second part of the house. 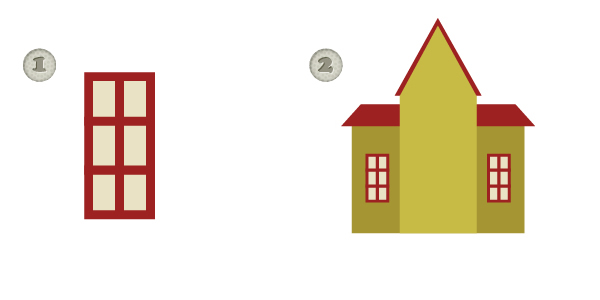 Use the same roof color and match it with a slightly darker wall (R=131 G=22 B=25). To make a door, draw a rectangle (R=200 G=186 B=68). 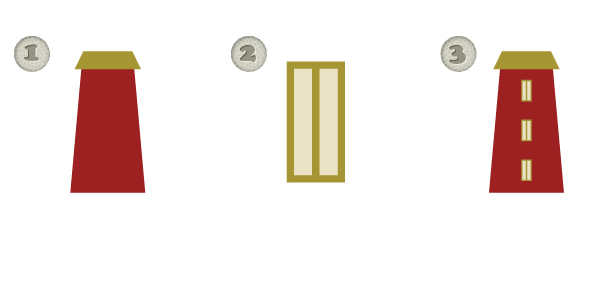 Use the Add Anchor Point Tool (+) to add two anchor points on the top side of the door. 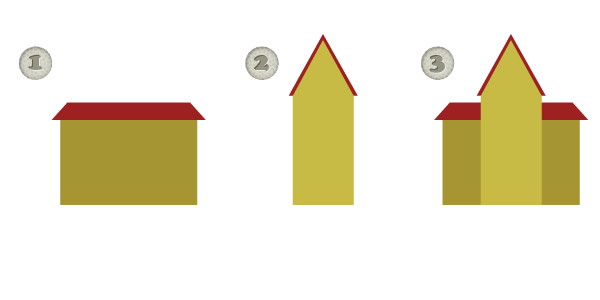 Use the Direct Selection Tool (A) to move them a little closer to each other and up. Now, lets create a mansard. Draw a rectangle (R=200 G=186 B=68). Add one more anchor point on the top side of the rectangle and move it up. Place a triangle (R=157 G=33 B=33) behind the newly created shape. Add a window. The color for the window frame is R=166 G=150 B=51. No changes for the glass. Copy the door from the 3rd house. Use the Eye Dropper Tool (I) to make its Fill color as you would for the window glass. Go to Object > Path > Offset Path. In a new window, enter Offset 10 px, Joins Miter, Miter limit 4. Draw a few rectangles to complete the window frames. 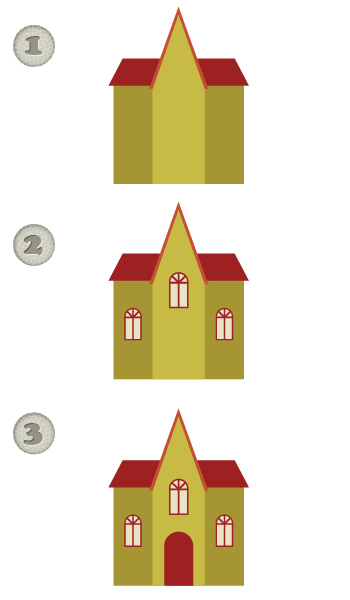 Create three windows and place them on the house. 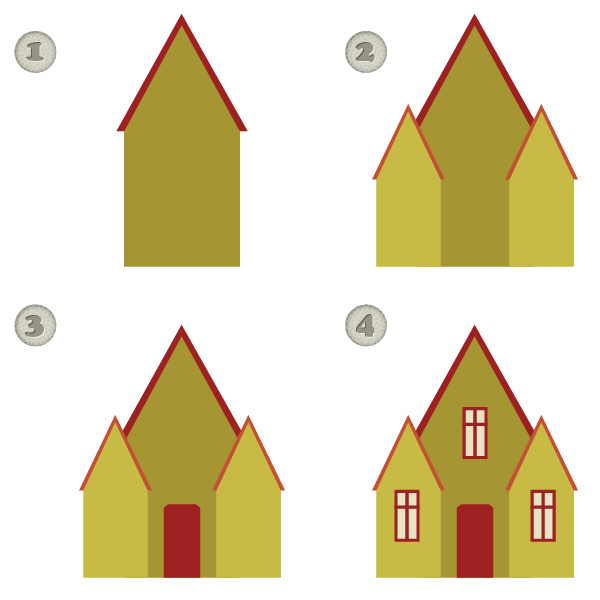 Draw the 4th house like how you drew the 2nd house in step 5.1. Add on the top side fifth anchor point and move this point up. Place a triangle (R=157 G=33 B=33) behind it. We need to make two copies of this in a lighter shade. 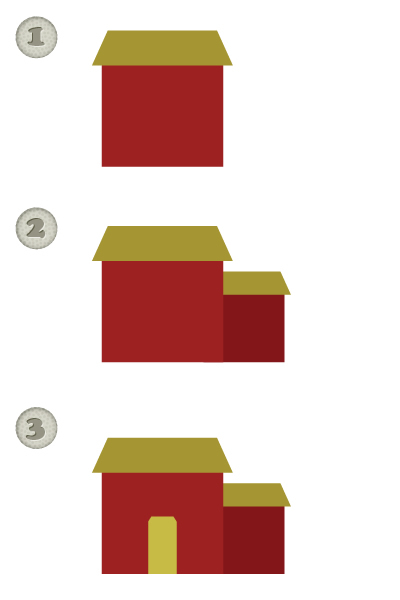 The lighter yellow setting is R=200 G=186 B=68, while a lighter red is R=196 G=81 B=50. 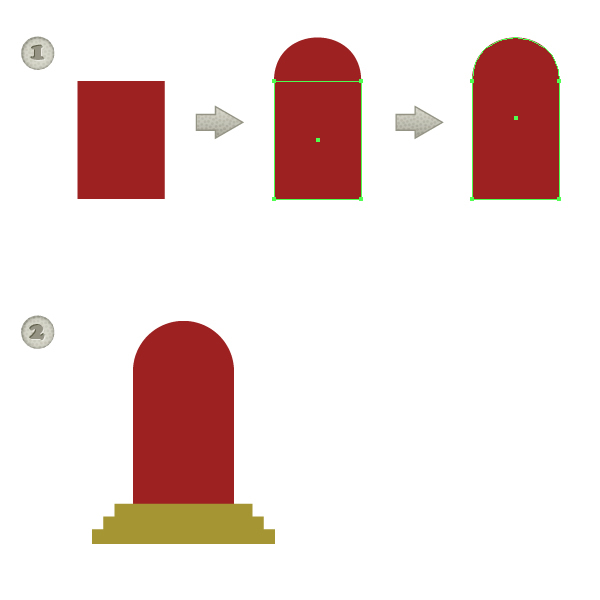 Copy the door from the 3rd house which you created in step 6.1. Change Fill color to R=157 G=33 B=33. Make two more copies and place them onto the house. 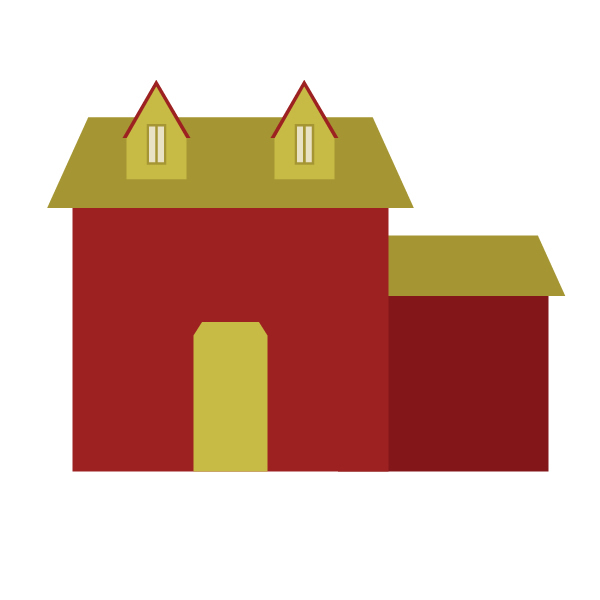 Create this by simply taking parts from the previous houses using the Eyedropper Tool (I)! It’s a good practice for you! By now, you should be an experienced builder already, so create this on your own 😉 Feel free to use your imagination to create something new! 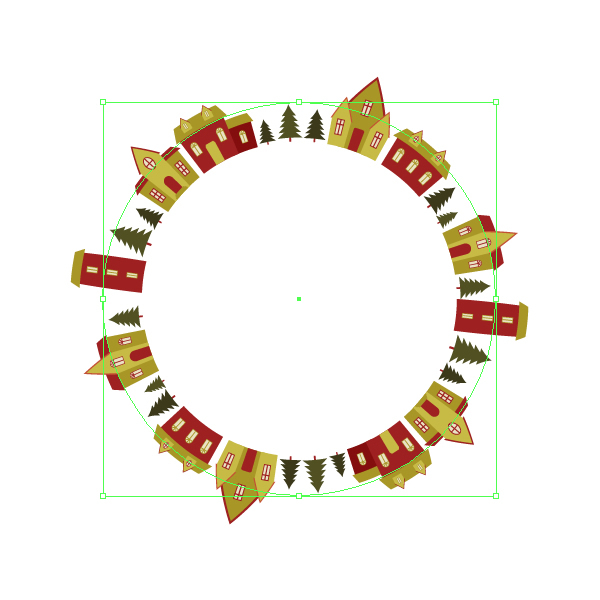 Arrange houses and Christmas trees in a line. 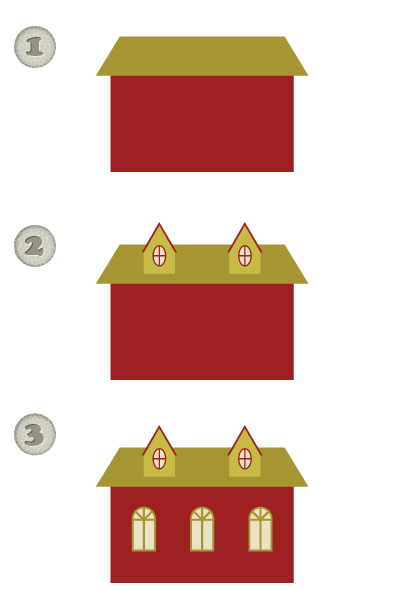 Make a copy and place them in the same line so that every house will be presented twice. Select the whole line and drag it to the Brush panel. A dialogue window New Brush will appear. Select New Pattern Brush and press Okay. 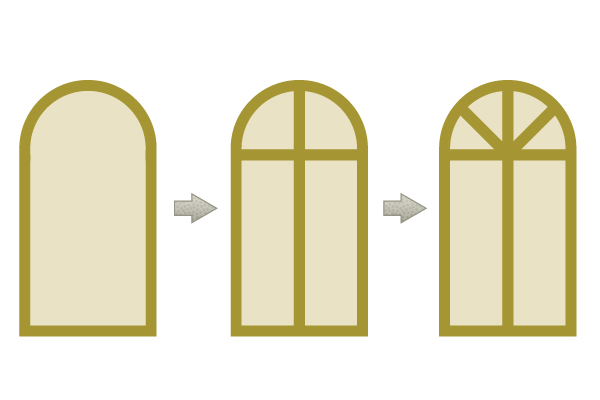 A second window will pop-up – Pattern Brush Options. Enter the following options: Name: House Brush, Scale 100%, Spacing 0%, Original, Fit: Stretch to fit, Colorization Method: None. Press Okay. Make sure its non-fill color, pick any stroke color and draw a circle. There! You’ve just created your new pattern brush on the Brush panel! 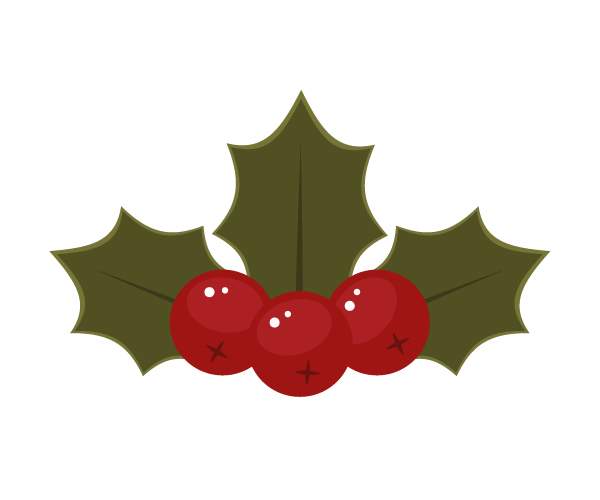 Place this house circle behind the circle with text and holly berries. 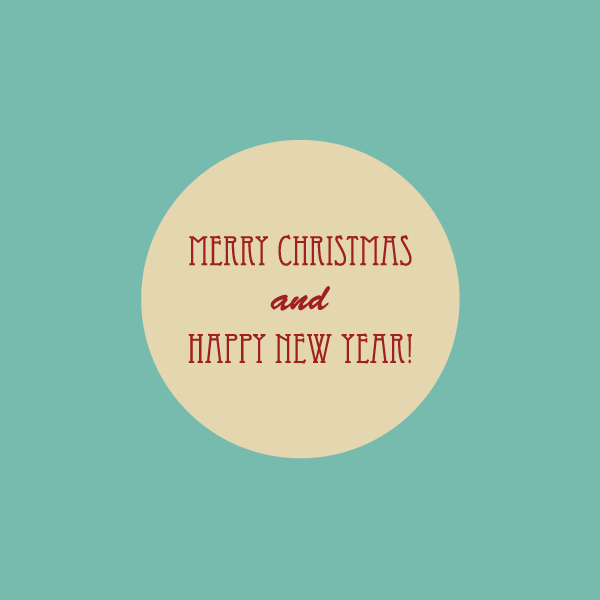 Your greeting card is almost done! To decorate the card, we’ll need snowflakes! Delete the stroke color and make it a gray Fill color. You’ll change this Fill color to white later, but for now let’s use gray so that you can see what you’re drawing. Hit the Pencil Tool (N) and on the Stroke panel, increase the stroke Weight and check the Round Cap button. You need to adjust the Pencil Tool (N) options. So, double-click on this tool and enter this in a new window Tolerances Fidelity 4 pixels, Smoothness 40 %, Options: Fill new pencil strokes. 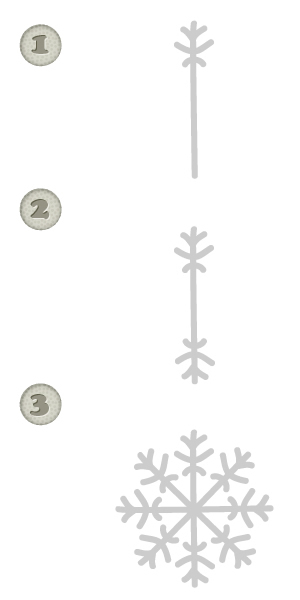 Draw the lines to start the snowflake as shown in the image below . Reflect small lines (not the long, vertical one) horizontally (right-click the mouse > Transform > Reflect). Enter in a new window Axis: Horizontal, Angle 90 degrees, Options: Objects and press Copy. 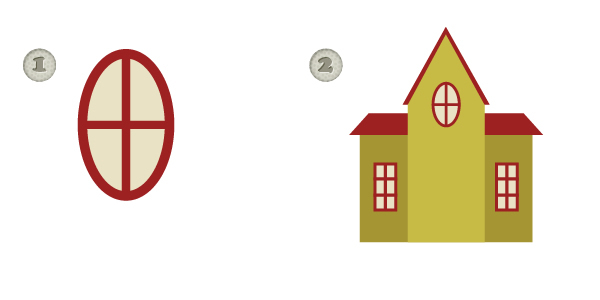 Select what you made in Image 2, press the Rotate Tool (R) and press the Enter button on your keyboard. In a new Rotate window, type 45 degrees, Options Objects, and press Copy. Keep pressing Control-D buttons until the snowflake is done. Change the stroke color to white and expand it (Object > Expand, Stroke, Okay). Take the snowflake to the Symbols panel. In the Symbol Options window enter Name: Snowflake, Type: Movie Clip, Okay. Adjust the options (double-click on Symbol Sprayer Tool). In the new Symbolist Tools Options, enter Diameter 100 px, Intensity 5 Fixed, Symbol Set Density 5, Average. And now, the fun part! Take the Symbol Sprayer Tool (Shift+S) (make sure that the new Snowflake symbol is selected from the Symbols panel), and scatter the snowflakes around! Alternately, take all the tools under the Symbol Sprayer Tool (Shift+S) on the Tools panel, click on the snowflakes and see what happens! To make your greeting card pop, you need to add some textures! Download an image from the 123rf database that you like. I’ve chosen image ID : 7915849. Take this image to the Swatch panel. Go to your background (blue square 600 px) and on the Appearance panel, press Add New Fill from the pop-up menu. Make this new fill your downloaded image, reduce the Opacity to 50%… and you’re done! Hope you’ve enjoyed this tutorial as much as I did 🙂 Do share your comments and questions below! 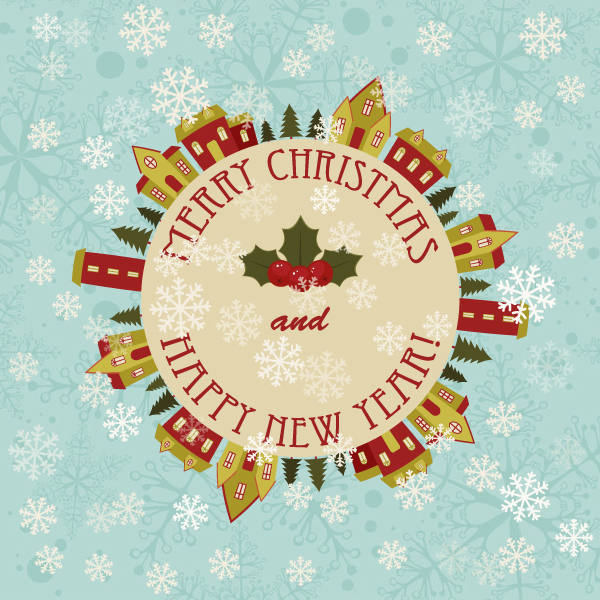 Season’s Greetings & Happy Holidays From 123RF!